Originally from Lafayette, Rebecca is a 2002 graduate of Longview High School in Longview, Texas, and a 2005 graduate of LSU, where she earned a Bachelor of Arts degree in Political Science with a minor in History. At LSU, she was a member of Delta Zeta sorority and volunteered with Prevent Child Abuse of Louisiana. Rebecca then completed a post-baccalaureate certificate program in early childhood education from LeTourneau University before enrolling at the LSU Paul M. Hebert Law Center in 2006. In law school, Rebecca was chosen to participate in two of LSU's inaugural clinic courses: the Domestic Violence clinic and the Family Mediation clinic. Sworn into the Bar as a student attorney, Rebecca represented victims in the 19th Judicial District Court. She also successfully mediated child custody disputes. Rebecca served on the Chancellor's Committee; as vice president of the Legal Association of Women; as vice president of the Civilian Society; and as her section's representative in the Student Bar Association. Rebecca also volunteered as a court appointed special advocate (CASA). Following graduation from LSU Law in 2009, Rebecca clerked for the Honorable Phyllis M. Keaty at the 15th Judicial District Court and the Third Circuit Court of Appeal. During that time, she also worked part-time as a consultant to the Regional Healthcare System of Acadiana; served on a taskforce assigned to research and create an international family mediation pilot program for consideration by the American Bar Association and U.S. State Department; taught a Louisiana Notary Public course to aspiring notaries; was active in the Lafayette Bar Association and the American Inn of Court of Acadiana; and volunteered with United Way of Acadiana as a Reading Buddy. After clerking for Judge Keaty, Rebecca spent several years as an associate attorney in private practice. In those capacities, she worked on complex community property partitions, disputed succession litigation, and contested custody cases; regularly represented clients in divorce, child, and spousal support matters; and worked directly with clients to create personalized matrimonial agreements tailored to meet each couples' unique needs. Rebecca also has experience in workers' compensation and personal injury matters. 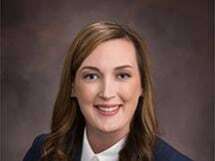 For the last four years, Rebecca has served as a judicial law clerk, first to Judge Charles Fitzgerald at the 15th Judicial District Court and most recently to Judge John E. Conery at the Third Circuit Court of Appeal. Rebecca is a member of the Louisiana State Bar Association, the American Inn of Court of Acadiana, Junior League of Lafayette, and sits on the Board of Directors of the Family Tree as chair of its education division. She is licensed to practice in all Louisiana state courts.